Aubrey Drake Graham is a Canadian rapper, actor and songwriter born on October 24, 1986. 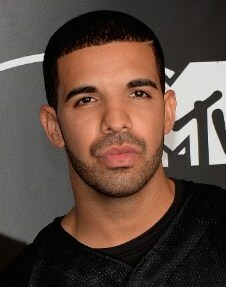 Drake earned recognition from the television series Degrassi: The Next Generation. He later on rose to prominence and got success and fame as a rapper by releasing numerous mixtapes such as Room for Improvement and If You’re Reading This It’s Too Late. Drake as well released some studio albums as a singer including Thank Me Later, Take Care and Nothing Was the Same. These albums received critical acclaim and Drake also produced some of their singles including Over, Find Your Love, Headlines, Take Care, The Motto and Started from the Bottom. Drake received several awards as a music artist such as three Juno Awards, Grammy Award, six BET Award and set some significant Billboard records as well. Being a song writer, he has also written songs for other music artist including Alicia Keys, Jamie Foxx and Trey Songz. The rapper Drake Graham body measurements are listed below including his height, weight, chest, biceps, waist and shoe size. The tattoo of Aaliyah is on the back of Drake. The favorite music group of Drake is N.E.R.D. The favorite fast food place of Drake is McDonald’s. Drake used to write all his songs and raps straight into his Blackberry phone instead on paper or notebook. I have a question and it’s for school. I this website a written source? Or is it just a blog?